The main tenets of living a healthy lifestyle are repeated by physicians, in magazine articles, on television shows, and even your mother: eat a healthy diet, exercise regularly, and get plenty of sleep. But there is an additional tool to use in your quest for good health and longevity – meditation. Meditation may sound radical or “hippy-dippy” to some, but more and more research is showing that those who meditate are experiencing real health benefits from this practice. Benefits that can improve your brain health and potentially prolong your life. It is a well-known fact that as we age our brain volume declines. This decline is a slow progression but becomes more pronounced after the age of 50. The result is slower motor skills and cognitive ability. Although this decline is inevitable, it manifests itself differently in each person and is most strongly influenced by an individual’s healthy habits. Aging can be seen as an accumulation of stress over the years. The average woman over 40 years old is juggling a spouse, children, work, friends, finances, caregiving, and her changing body. She experiences about 50 stress responses per day, and this can take a toll. Chronic stress elevates levels of cortisol (the stress hormone) which can inhibit your immune system, reduce the volume of gray matter in your brain, and harm your memory. Prolonged periods of raised levels of cortisol can affect your blood pressure and fats within your blood resulting in a higher risk for a heart attack or stroke. 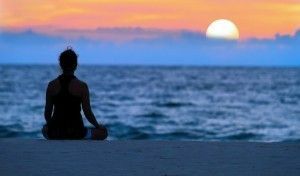 Meditation promotes telomere health. Telomeres are the protective ends of chromosomes indicative of your biological age (rather than your chronological age). Studies have found that those who meditate have longer telomeres. According to the Department of Psychiatry at the University of California San Francisco, shorter telomere length in cells is linked to a poorer immune system, cardiovascular disease, and degenerative conditions such as osteoporosis and Alzheimer’s. As we age, telomere shortening happens naturally, but research shows it can be accelerated by stress which can speed up the aging process of your body. What are the other benefits of meditation? The practice of meditation involves slow, mindful breathing. It relaxes an individual physically by calming our fight-or-flight response, but there are many other benefits to meditation. In the present. Meditation allows you to be “in the present” instead of worrying about the past or making plans for the future that can only add to your stress level. Step back. Meditation is dedicated time to analyze negative thoughts or stressful situations to determine if these are reality or passing events. Meditation and other forms of deliberate relaxation allow you to step back and change how you perceive the stressors in your life. Improves concentration. A calm, focused mind improves your concentration and ability to multitask. Reduces blood pressure. Relaxation increases the compound nitric oxide that causes blood vessels to open and blood pressure to drop. We know that stress can have long-term, negative effects on your health. Try meditation for yourself to see if it can reduce your stress and improve your quality of life.